A powerful spell has drained all the mystical energy from the enchanted land of Skymist, and it's up to you to recover the lost Spirit Stones and restore peace to the kingdom! Find clues and keys, solve puzzles, and uncover secrets as you journey across the mysteriously transformed land, all while unraveling the tale of a misplaced cast of storybook characters. 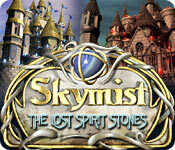 Go on a crazy Hidden Object adventure in a fantasy world! Travel to Rome with Rhianna Ford, and confirm the authenticity of a still sealed letter allegedly written by Da Vinci! Help Angel figure out what is real and what is in her head as she attempts to escape from a Mental Hospital!